There are a number of reasons why you might want to relocate the alternator. The most likely is that you’re doing an engine swap and the standard position causes the alternator to foul something. But you might also need to move the alternator if you’re fitting a much larger unit to run an upgraded sound system or lights. In either case, you’re going to need to make a new alternator mount. If you look at standard factory alternator mounts, you’ll see a couple of important things. Firstly, modern cars typically use castings to form the main (usually it’s the lower) alternator mount. 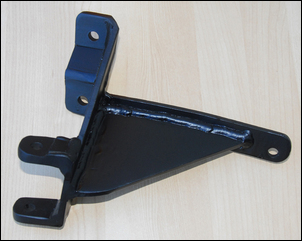 The casting – often with a wall thickness of 10mm or more – attaches to the engine block with two or three 8 or 10mm bolts. 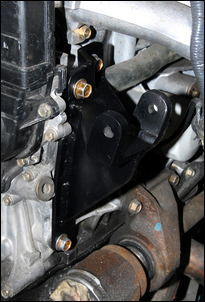 This mount in turn attaches to the widely-spaced mounts on one side of the alternator, providing a pivot point. 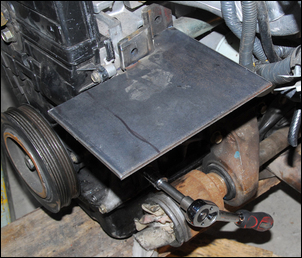 On the other side of the alternator is a slotted adjusting bracket, allowing the belt tension to be altered. 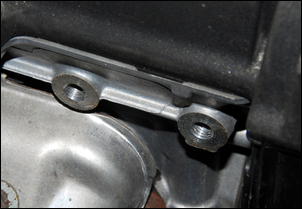 The adjusting bracket also bolts to the block, usually using a single bolt but sometimes two bolts. 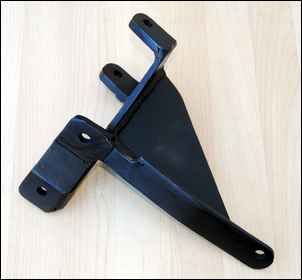 The adjusting bracket is most often not a casting but a pressing. So? Well, take a look at how bloody strong the factory mounts are! It’s no exaggeration at all to say that some alternator mounts (and also air conditioner compressor mounts) are as heavy-duty as the engine mounts! · The inertial loads on the brackets as the car passes over bumps means that the ‘weight’ of the alternator can double or triple – and they’re pretty heavy to start with. · All engine vibration is directly transmitted to the mount, so they’re subject to high fatigue loadings. 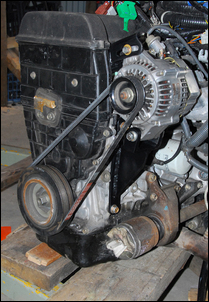 · The brackets need to hold the alternator rigidly in position, even under the tension and drive loads of the belt. 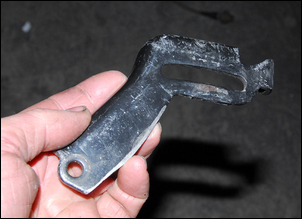 The implications for any new alternator mounts that you make are clear – they need to be really, really strong. 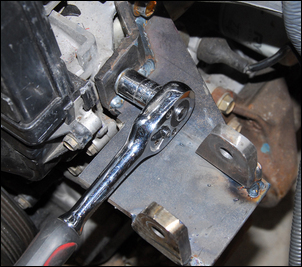 If you do a web image search on ‘broken alternator mount’ you’ll very quickly find pics of many broken mounts. Usually (but not always) they’ve been fabricated to mount a relocated or non-standard alternator. If space is really tight, you also need to be careful to provide sufficient clearance so that the belt can be placed on the pulleys and then the alternator pivoted to tension the belt. Extension of the main power feed and any alternator control wiring is relatively straightforward, so the current location of the wiring isn’t an important consideration. It’s not worth having a casting made for a one-off alternator relocation, so the new brackets will be fabricated. It obviously depends on the exact size and shape of the brackets, but typically you will need to use 6mm or 8mm thick steel plate. But isn’t that way overkill? Nope – again check the thickness of factory cast mounts… and they’re usually smaller than the brackets you’ll need to make. 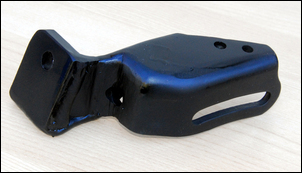 The thick plate can be laser or water-jet cut – assuming you have drawings of the required parts. If you don’t, or you want to be able to make the bracket mainly at home, use an angle grinder and 1mm thick cutting discs to cut the plate to shape. 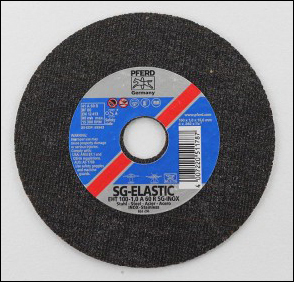 When working with this thickness of material you will need to use high quality cutting discs (crap ones will just turn to dust) and expect to go through a good number of them. 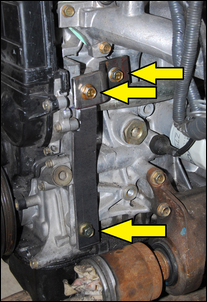 A revised alternator mount should ‘pick-up’ on as many block mounting bolts as possible. For example, using just two bolts is insufficient – the alternator will potentially twist its mount (so causing belt alignment issues) and on an alloy block may break off the threaded bosses. Three or four bolts are the minimum number of attachment points. That sounds fine but the trouble is that in practice, the block’s threaded bolt bosses are often not in the right places for your bracket! For example, some blocks used threaded bosses that are not in line or even in the same plane. The moral of the story is that you have to build your bracket out from the existing bolt holes, rather than come up with a bracket design and then try to fit it to the block. In some cases, other bolted-on attachments may need to be utilised. For example, longer bolts can be used to allow your new alternator bracket to utilise air con compressor or power steering pump attachment points. Never try to attach your alternator mount to small diameter bolts that are holding (say) a rocker cover or cam cover in place. 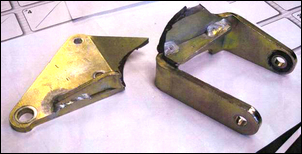 They will break off, and the block or head castings may be damaged. I needed to move the alternator on this Honda engine in order to provide more clearance for an engine swap. 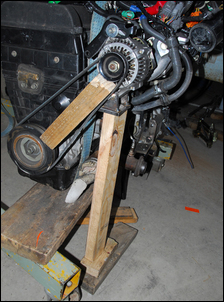 After the new general location of the alternator was picked, I propped it in place with pieces of timber. This allowed me to start working out which block threaded bosses I could use for the new mount. Working from these threaded bosses, I then started forming the part of the bracket that would bolt to the block. Ten millimetre diameter bolts are being used. Note how none of the block’s threaded bosses are either in line or in the same plane! … and then the correct location of the alternator could be ascertained by sliding it around on the plate. 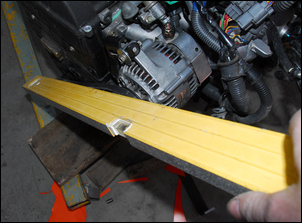 Here a long straight edge is being used to ensure that the crankshaft and alternator pulleys are in line. 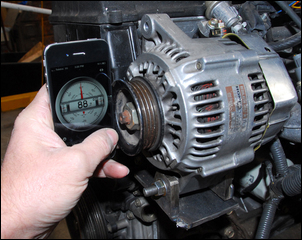 In addition to being in line, the axis of the alternator needs to be parallel with the crank – that is, when the crankshaft is horizontal, the alternator also needs to be horizontal. Here this is being determined by measuring the verticality of the pulley edges, using a phone app. The alternator mounting lugs can then be tacked into place. Note how the design allows clearance for the socket on the block mounting block – it’s very easy to make a bracket that doesn’t give room for tools! Paper templates are useful when making-up pieces of the bracket. 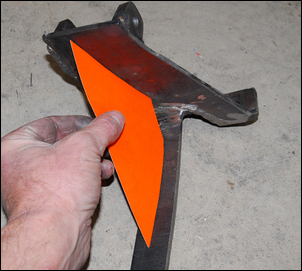 Here the template is being used to develop the shape of a stiffening gusset. The final welded bracket, from one side…. 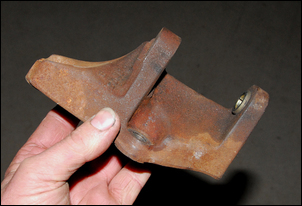 The slotted adjustment bracket was formed from the original Honda bracket, but with an altered mount. The installed alternator in its new location. The bracket shown here was MIG welded. But what if you don’t have the gear? Easiest to pick up a very cheap arc welder (from $25 secondhand) and just tack the pieces together. (Tacking is easy, even if you’re a beginner.) 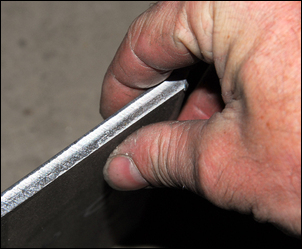 You can then take the tacked assembly to a professional to be properly welded. One thing’s for sure - making a strong bracket that precisely mounts an alternator in a new location is something that can’t be rushed. But work step by step, take your time and make a lot of checks, and the result will be a success. Drains and landscaping - and passing council inspection! This is what happens when you put a current Merc diesel into a 20 year old body!